A new, versatile plastic-composite sensor can detect tiny amounts of water. 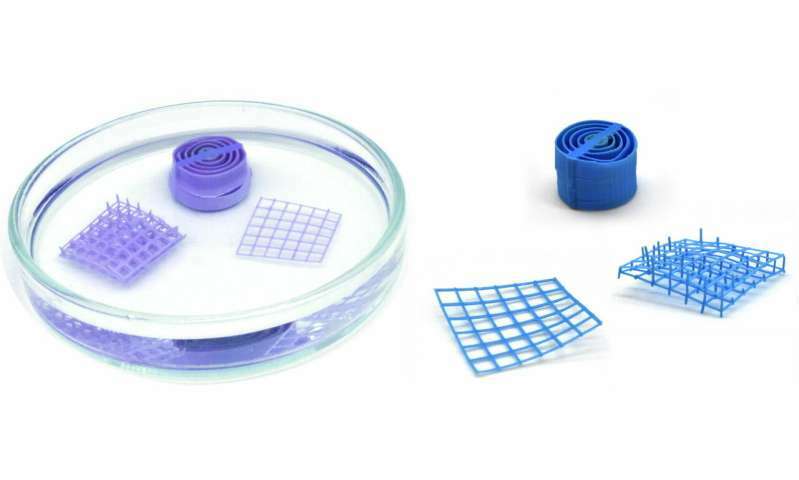 The 3-D printable material, developed by a Spanish-Israeli team of scientists, is cheap, flexible and non-toxic and changes its colour from purple to blue in wet conditions. The researchers, led by Pilar Amo-Ochoa from the Autonomous University of Madrid (UAM), used DESY's X-ray light source PETRA III to understand the structural changes within the material that are triggered by water and lead to the observed colour change. The development opens the door to the generation of a family of new 3-D printable functional materials. The study is published in Advanced Functional Materials. In many fields, including health, food quality control, environmental monitoring and technical applications, there is a growing demand for responsive sensors that show fast and simple changes in the presence of specific molecules, and water sensors are among the most commonly used. "Understanding how much water is present in a certain environment or material is important," explains DESY scientist Michael Wharmby, co-author of the paper and head of beamline P02.1 where the sensor material was examined with X-rays. "For example, if there is too much water in oil, it may not lubricate machines well, and if there is too much water in fuel, it may not burn properly." The functional part of the scientists' new sensor material is a copper-based coordination polymer, a compound with a water molecule bound to a central copper atom. "On heating the compound to 60 degrees Celsius, it changes colour from blue to purple," says Pilar Amo-Ochoa. "This change can be reversed by leaving it in air, putting it in water, or putting it in a solvent with trace amounts of water in it." Using high-energy X-rays from DESY's research light source PETRA III at the experimental station P02.1, the scientists observed that in the sample heated to 60 degrees Celsius, the water molecule bound to the copper atoms had been removed. This leads to a reversible structural reorganisation of the material, which is the cause of the colour change. "Having understood this, we were able to model the physics of this change," explains co-author José Ignacio Martínez from the Institute for Materials Science in Madrid (ICMM-CSIC). The scientists were then able to mix the copper compound into a 3-D printing ink and printed sensors in several different shapes which they tested in air and with solvents containing different amounts of water. These tests showed that the printed objects are even more sensitive to the presence of water than the compound by itself, thanks to their porous nature. In solvents, the printed sensors could already detect 0.3 to 4 per cent of water in less than two minutes. In air, they could detect a relative humidity of 7 per cent. If it is dried, either in a water free solvent or by heating, the material turns back to purple. A detailed investigation showed that the material is stable even over many heating cycles, and the copper compounds are evenly distributed throughout the printed sensors. Also, the material is stable in air over at least one year and also at biological relevant pH ranges from 5 to 7. "Furthermore, the highly versatile nature of modern 3-D printing means that these devices could be used in a huge range of different places," emphasises co-author Shlomo Magdassi from The Hebrew University of Jerusalem. He adds that the concept could be used to develop other functional materials as well. "This work shows the first 3-D printed composite objects created from a non-porous coordination polymer," says co-author Félix Zamora from the Autonomous University of Madrid. "It opens the door to the use of this large family of compounds that are easy to synthesize and exhibit interesting magnetic, conductive and optical properties, in the field of functional 3-D printing."